Voilà! If you have ever dreamed to go through the sapid archives of CHANEL history (as I, for instance, did), CHANEL have them finally uncovered. With a launch of the 'Inside CHANEL' campaign, the brand will reveal piece by pieces this delicious information. 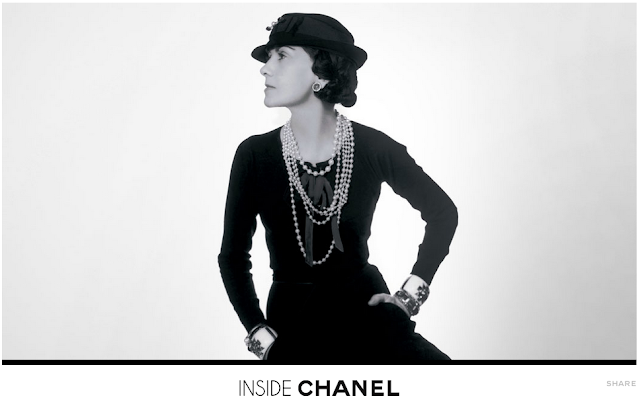 A dedicated web-site (www.inside-chanel.com) was designed to be a heart of the campaign. There you can go back in time and experience a life history of the founder of the brand - Coco Chanel, as well as to follow the evolution of the 'marque de luxe'. The timeline starts with a birth of Gabrielle 'Coco' Chanel in 1983 and goes as far as 2012, celebrating a launch of the book and photo exhibition "The Little Black Jacket' by Karl Lagerfeld and Carine Roitfeld. The first iconic product what campaign is focusing on is surely perfume Chanel N°5. Mademoiselle Chanel launched this fragrance back in 1921 and since then this truly timeless classic remains the ultimate symbol of femininity. Curious about the story-behind-the-scenes of N°5 creation and flowering? - Then have a look at the two films below. Done with such a TESS!! The legend of N°5. Journey back in time through the CHANEL archives into the heart of this magical perfume, beginning with the revolutionary moment of its creation. Discover what inspired Marilyn's world-famous reply. So, what do YOU wear to bed? I love CHANEL (not the scent of N°5 though), so have got those stickers on the wall of my bedroom far before the film was shoot. Very inspirational quote which puts me in the right mood when I am heading to bed. ...mmm, sweet dreams!